The May 2015 Lecce Italian Language Experience is now over and what a month it has been. The last two weeks were as good as the first two. Highlights included the UNESCO listed Alberobello, the amazing Grotte di Castellana limestone caves, and Lecce Cortili Aperti, a one-day event held only in May when Lecce's stately homes and palazzi open up their courtyards and gardens for all to visit. No major event in Lecce is complete without music and food and so it was with this one. Thousands of people jammed the streets to enjoy the day. My personal highlight of the last two weeks was the Festa della Madonna della Coltura in Parabita, a small town south of Lecce. Tens of thousands of people turned out for three days of religious observance and celebration that finished with an amazing fireworks show. Foreign visitors are rare so it was a real privilege to be there. Our group was such an oddity that we were interviewed by the local internet TV station (70 min in). A big thank you to Anna Luperto, the Director of la Scuola di Italiano per Stranieri in Lecce and all the staff of the school including Patrizia, Dario, Valentina, Emma, Barbara and our driver Gigi. See you all again in September. Want to know more about what we got up to? 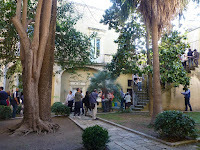 Just visit the Learn Italian in Lecce Facebook page. and select "like". Link: Learn Italian in Lecce Facebook page.